In his decade-long career, Caribou's Dan Snaith has fluidly moved between genres like folktronica, shoegaze, krautrock, and 1960s sunshine pop, assimilating their most familiar traits until they're practically in his DNA. His albums have felt warm, loose, and ecstatic (especially 2003's still-career-best Up in Flames), despite Snaith's behind-the-boards meticulousness. Snaith's latest, Swim, is even heavier on the precise sonic detail, and it's all the more impressive for it. Made with help from kindred spirits including Four Tet's Kieran Hebden, Junior Boys' Jeremy Greenspan, and Born Ruffians' Luke Lalonde, it was borne out of a desire to create "dance music that sounds like it's made out of water." 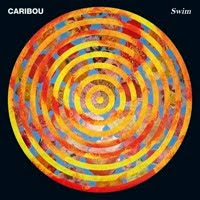 Swim is darker both in tone and spirit than its predecessor, 2007's day-glo Andorra, swapping expansive drum-circle arrangements and ebullience for chilly rhythms and a bummed-out disposition. Easy entrance points here are scarcer than on any of Snaith's previous full-lengths-- as with 2005's kraut-centric The Milk of Human Kindness, repeat listens are key. Definitely my album of the week. Thanks to Kael for putting the album into my dropbox. I'm in love with the track - "Odessa". .Creamfields U.K 2010 - line up trailer. Anyone you can think of, will be there. Super retro-futuristic hipster-matic color-dashy hippie-ish new track by Yeasayer - Brooklyn, New York. Yeasayer O.N.E. from Paranoid US on Vimeo. ceo - prologue from Modular People on Vimeo. Well, there is always a music-making everything. And now shoes is one of them. The agency is W+K Tokyo. See the whole making of here. I hate to sound like a sourgrape. But I could have sworn that I've thought of an electronic paper or digital mobile photo album 1st - in 1999. Just like James Cameron have thought that Star Wars should have been his movie to be made, it is sadly never about who had thought of the idea 1st, but who had done it first. Still, he has now a good vengeance with Avatar, while I'll wait for my next Nirvana. Very nice R&D and execution by these guys from Bonnier regardless. Sigh. You gotta open your mind for this warped video. No, literally. Beautifully art directed, it's somewhat setting between Avatar and Sweeney Todd in black and white. WeWereMonkeys: Land of Talk - It's Okay on Vimeo.